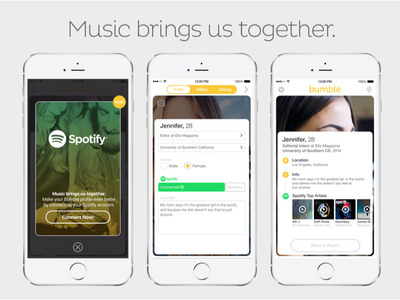 Bumble and Spotify: It’s a match! The dating app, known as the “Feminist Tinder,” announced on Wednesday that it would partner with Spotify to help users find suitors who share their music taste. Here’s how it will work: Bumble users can opt into showcasing their Spotify top artists on their profile page, which Bumble hopes will give users more information about a potential suitor and potentially serve as a conversation starter. The musical preferences will also be programmed into Bumble’s algorithm so that people with similar music tastes will show up first. So, if you primarily swipe right on pop music fans, users who like pop music will show up first the next time you open the app. Wolfe, a Tinder cofounder who left that company after filing a sexual harassment lawsuit, says she’s been eyeing a partnership with Spotify since she launched her app shortly after leaving Tinder. On Bumble, female users have to initiate conversations with matches. 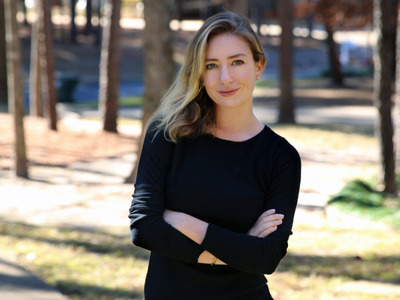 Whitney WolfeBumble founder Whitney Wolfe. After over a year of discussions between the two brands, the partnership was solidified. Wolfe says they initially considered putting favourite songs in profiles, but ultimately decided on artists. “We wanted to make it a little more overarching,” she says. It isn’t the first Silicon Valley partnership for either company. Spotify has inked deals with tech giants like Uber, Facebook, and Google. Bumble, meanwhile, has a partnership with Snapchat to allow users to add filters to their profile pages. And Wolfe says there will be more partnerships in Bumble’s future. Wolfe says Bumble is looking for hyper-local partnerships with restaurants and ride-sharing apps in areas with a large concentration of users to help improve the dating experience offline. “We want to add value through the entire dating process,” she said.